A University of Toledo student who has spent the last two school years interning at the Toledo Area Humane Society said research has shown that increased cross-reporting between organizations investigating animal abuse and those looking into the abuse of people would go a long way toward reducing or halting that violence sooner. Toward this end, the UT student has summarized this research, taken it on the road, and shared it with numerous anti-violence service providers. “The line separating an animal abuser from someone capable of committing human abuse is much finer than most people care to consider,” said Jason Wegman, a graduate student working toward a master’s degree in social work. “People abuse animals for the same reasons they abuse people — to find power, joy and fulfillment through the torture of a victim they know cannot defend itself. “Some of them will stop with animals, but enough have been proven to continue on to commit violent crimes against people that it’s worth paying attention to,” Wegman said. In fact, according to Wegman and John Dinon, the Toledo Area Humane Society’s executive director, animal abuse is often an early indicator of a chaotic household where the safety of children could be compromised. “Animal protection personnel are often the first public agency to intervene in cases of abuse because society often has a lower tolerance for, a greater chance of observing, and an increased willingness to report animal abuse than child or domestic abuse,” Dinon said. Wegman, who also works for Lucas County Children Services as an assessment case worker, said he and Dinon have given a number of presentations to organizations throughout northwest Ohio to highlight this link. As examples of ways abusers can use animals to manipulate victims, Wegman pointed to threats or acts of violence against children’s pets to coerce and control children to maintain silence or acquiescence in sexual assault. Fortunately, in collaboration with the YWCA Battered Women’s Shelter, the Toledo Area Humane Society has a Safe Place Program that provides temporary housing for pets of people leaving domestic violence situations. Wegman also said that studying children’s cruelty to animals is a revealing source of information and a red-flag warning of future antisocial behaviors. “Many boys in abusive households are at risk of becoming abusers; even more girls in these homes are at risk of becoming victims,” he said. Dr. Janet Hoy, assistant professor in the Department of Criminal Justice and Social Work, said the relationship between UT and the Toledo Area Humane Society is a unique one. “We are the first and only social work program in the country that has developed field placements for social work students at a humane society,” Hoy said, adding that she, in collaboration with UT colleagues Martha Delgado and Heather Sloane, presented the new relationship at the national Council on Social Work Education, which took place in Atlanta last fall. “Since our presentation, we’ve been contacted by several social work programs interested in replicating our field placement structure within humane societies. I’m very proud of the leadership role UT is playing in raising awareness of this dimension of human-animal interconnectedness within the social work practice arena,” she said. Surfing The University of Toledo’s websites has become a bit more user-friendly as utoledo.edu and utmc.utoledo.edu launched Google Custom Search, which for nonprofits provides a cost-effective, ads-free product for web navigation. Implemented on utoledo.edu and marketing-focused UT websites last week, Google Custom Search has been adapted by the Center for Creative Instruction so visitors can find content on the UT website easier. The new search takes advantage of Google’s auto-complete technology to suggest common search criteria starting with the first word typed. Additionally, the web team studies UT site visitor behaviors, incorporates focus group feedback, and aligns efforts with marketing and enrollment to assure search results meet visitors’ needs. The new search engine comes on the heels of the introduction of OmniUpdate, a new web content management system that was rolled out a year ago that allows content owners to manage college, department and office web sites. The UT home page and top-level pages followed with a redesign to focus on recruiting students from all populations in December. The University of Toledo Athletic Department’s annual Reverse Raffle and Auction Fundraiser will be held Saturday, May 19, at 7 p.m. in Savage Arena. The Reverse Raffle is a night of fun, food and games. A limit of 350 tickets at $125 each are sold for the event. Each ticket admits the purchaser and one guest to the event and provides the opportunity to win the $7,500 grand prize or one of many cash prizes or gift items. Buffet grazing stations, as well as snacks and beverages, will be available throughout the night. In addition, each purchaser of a reverse raffle ticket will receive six coupons good for six tickets to UT home football games at the Glass Bowl (a $154 value). The Athletic Department is seeking donations for prizes and auction items. Gift or service donations of all levels are helpful, from smaller prizes for “10th ticket” winners, to larger items that are used for the silent or live auctions. For more information, call the Athletic Development Office at 419.530.4183 or go to the www.utrockets.com. Drs. Richard D. and Elizabeth S. Ruppert helped shape health-care education in northwest Ohio and devoted their time to improving the community. Drs. 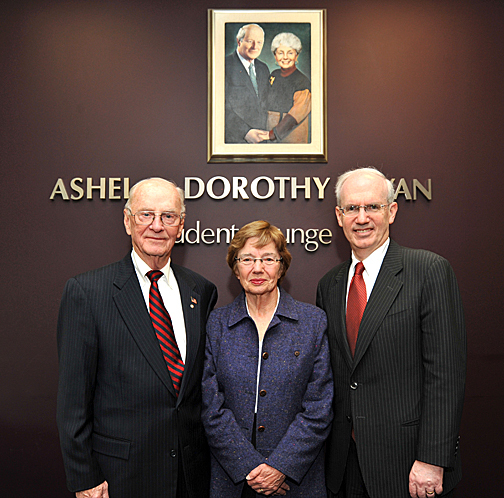 Richard and Elizabeth Ruppert posed for a photo with Dr. Jeffrey Gold, right, in front of a portrait of Ashel and Dorothy Bryan. The Rupperts received the Ashel Bryan Distinguished Volunteer Award. Richard Ruppert served as the third president of the former Medical College of Ohio from 1977 to 1993, and led expansive growth of the campus, student body, research funding and patient-care programs. Elizabeth Ruppert, while MCO professor of pediatrics from 1977 to 2003, was an advocate for health services for both children and mothers in her efforts to improve birth outcomes. For all of their efforts to advance the health and well-being of the greater Toledo area, the Rupperts received the Ashel Bryan Distinguished Volunteer Award. “The Rupperts have been tremendous supporters of medical education in Toledo and have gone beyond the important work of educating future health-care professionals to enhance community organizations that help people get access to the care they need,” said Dr. Jeffrey P. Gold, chancellor, executive vice president for biosciences and health affairs, and dean of the College of Medicine and Life Sciences. The Distinguished Volunteer Award is named for Bryan, former chair of the MCO Board of Trustees and well-known local businessman and philanthropist. Bryan and his wife, Dorothy, were longtime supporters of the Health Science Campus; their generosity provided an infusion center and supported renovations to the pharmacy, a boardroom and a student lounge, as well as a number of scholarship and endowments. Richard Ruppert, who had the longest tenure of any former MCO president, was honored in 1993 when the $11 million outpatient facility, the Ruppert Health Center, was named for him. During his career, he also served as vice chancellor for health affairs for the Ohio Board of Regents and as president of the Ohio Society of Internal Medicine and American Society of Internal Medicine. Involved in civic activities as well, he served as chair of a United Way of Greater Toledo fund drive, was a member of the Toledo-Lucas County Port Authority, and was president of the Ohio Historical Society. Elizabeth Ruppert began her medical practice as a neonatologist. In addition to her contributing to the education of hundreds of medical students at MCO, she served in the developmental and behavioral pediatrics and ambulatory pediatrics departments. She helped establish the EduCare Center and the Prescribed Pediatric Center to provide early services and support for families with children with special health-care needs. Elizabeth Ruppert also was a founding member of the Lucas County Initiative to Improve Birth Outcomes. The UT Medical Center Driver Rehabilitation Program is the only hospital-based one of its kind in northwest Ohio that is licensed to complete behind-the-wheel assessments in a specially modified car and train individuals with disabilities to return to driving with adaptations. 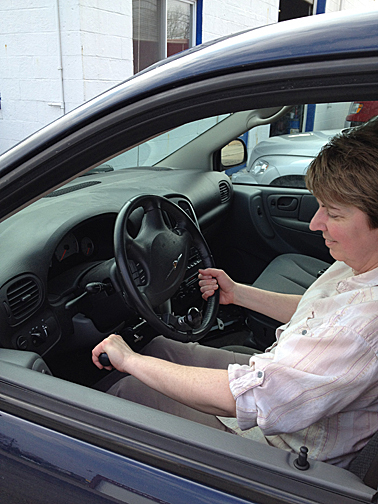 Gail Heath can chauffeur herself around again thanks to the Driver Rehabilitation Program and adaptive aids installed on her vehicle. The clinical portion of the program began in 1994 at the hospital; within the last three years, it began offering road training. Last year, the program performed 100 behind-the-wheel evaluations and training for a varied group of individuals. The goal of the rehabilitation is to help people maintain their independence through driving and determine if an individual’s health has affected his or her ability to drive safely. Occupational therapists working in the program are trained and certified to assess driving skills, make vehicle modification recommendations, and provide training. Drivers are assessed for their capabilities to continue driving and for whether they have the abilities to learn to drive with or without adaptations. After an initial assessment, the therapist may recommend the patient needs adaptive driving aids, which can include hand controls, special mirrors, or reduced-effort steering and braking systems. The therapist then trains the patient on how to use the driving aids in UTMC’s modified car. Heath, who has been diagnosed with multiple sclerosis and lost muscle strength on her right side last year, complimented Kesler as “one of the most patient men I have ever encountered in my life. “He never made me drive when I did not feel comfortable, but he still knew to push me past my limits in order to succeed,” she said. For more information on UT Medical Center’s Driver Rehabilitation Program and other rehabilitation services offered at the hospital, visit utmc.utoledo.edu/centers/rehab/outpatient.html. Santosh Pant, a PhD candidate in the Civil and Environmental Engineering Department, put in some extra Saturday class time at UT this semester. It didn’t have anything to do with the mechanical intricacies of engineering, but it had everything to do with building an outstanding career in his chosen field. 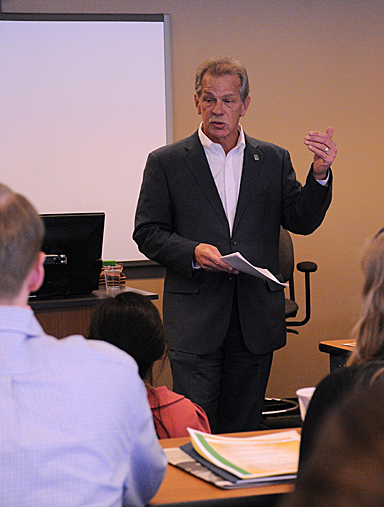 Randy Oostra, president and chief executive officer for ProMedica, gave the closing presentation at the recent Advanced Leadership Academy. Pant and about 50 other UT graduate students in business, law, engineering, pharmacy and education participated in the annual Advanced Leadership Academy, presented by the College of Business and Innovation. “We truly appreciate the opportunity to pull graduate leaders together from across our campus to learn from each other about the importance of leadership across all of our disciplines, to discover what leaders can and must do to make the world a better place,” said Dr. Clint Longenecker, UT professor of management. • “Leading for Results” by Longenecker. Participants also learned from UT Head Football Coach Matt Campbell and leading area business professionals, including Joe Feudi, financial services professional with Caputo & Associates, and Randy Oostra, president and chief executive officer for ProMedica. “With such talented faculty members and key community involvement, including ProMedica’s CEO Randy Oostra as our concluding speaker, the 2012 Advanced Leadership Academy certainly accomplished its goal of fulfilling what is the key College of Business and Innovation goal of developing lifelong leaders for the world of business and, in this case, in other key disciplines across the University,” Gutteridge said. “The best part of the Advanced Leadership Academy for me was getting to meet and work with graduate students from disciplines outside of business. I had no idea about the great things going on in the medical, pharmacy, education and engineering graduate programs. What an impressive group of graduate leaders,” said Capt. Trent Miller, an MBA candidate who is in the U.S. Army. Dr. Alfred Cave, UT professor emeritus of history, was selected the 2012 Distinguished Historian for the Ohio Academy of History Spring Conference and Business Meeting held last month at the Ohio Historical Society in Columbus. Cave delivered the Distinguished Historian Lecture, “‘Why the _____ Would Anybody Study History?’ A Comment on a Quip,” at the meeting, which brings together teachers, scholars, public historians and students interested in history. Cave joined the University in 1973 when he was appointed dean of the College of Arts and Sciences; he served in that capacity until 1990. Cave has mentored more than 75 UT students with their master’s theses and 20 with their dissertations as part of his commitment to the younger generations of scholars. 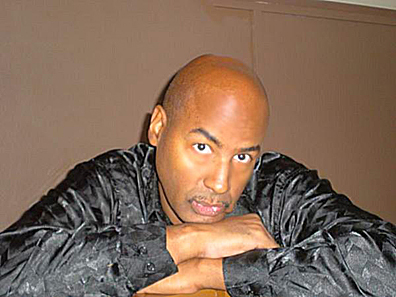 Cave received his bachelor’s degree from Linfield College and earned his master’s and doctoral degrees from the University of Florida. He has taught at the University of Florida, the City College of New York and the University of Utah. His scholarly works primarily focus on the Jacksonian era and American Indians. He has published seven books, most recently Lethal Encounters: Indians and Englishmen in Colonial Virginia (2011), which earned Cave an award nomination from the Ohio Academy of History. The University of Toledo is taking steps to ensure that students who have made appropriate provisions for payment of tuition and fees have improved access to classes they wish to take. According to the Office of the Treasurer, the University is introducing an invalidation process through which students may be removed from all classes and housing they are registered for if they have an outstanding balance and have not made appropriate payment arrangements by Tuesday, Aug. 14. The payment due date for fall 2012 is Friday, Aug. 10. Invalidation also is scheduled to take place for fall 2012 registration Monday, June 18, for students who owe $500 or more for spring 2012 and prior terms. All invalidations will be based on outstanding balances after financial aid and scholarships have been taken into account. According to Bowman, this practice will enable the University to better keep costs down by reducing uncollectible debt and associated administrative costs. It also will be beneficial to the general student population by making more seats available to paying students and keeps them from having their credit ratings negatively impacted by lack of tuition and fee payments. Various forms of communications will be distributed to those at risk for invalidation in June and mid-July as a reminder that lack of payment will mean removal from classes and housing. If students are removed, they will only be able to get back into their original classes or rooms if they are still available. • Turning in all dependent fee waivers for timely processing. Communications will be distributed across campus through the end of the semester and through the summer in an effort to raise awareness among students about the importance of paying bills in a timely fashion, while alerting them to the invalidation dates. A strategy is being implemented to raise awareness of the June 18 and Aug. 14 invalidation dates. National gospel recording artist and UT Music Instructor Ronnie J. Lindsey will debut his new Gospel Choir Ensemble Friday, April 27, at 7 p.m. in the Center for Performing Arts Recital Hall. Special guests for the concert will be Jimmel Stinson, keyboardist, bass player and drummer, who will lead the band, and Lisa Hightower, gospel and jazz singer. Lindsey returned to his alma mater to be the first African-American gospel music instructor. In 2004, he graduated from UT’s University College with a degree in vocal music and management, and continued his studies at Full Sail University, Winter Park, Fla. The first tenor and sometimes alto has worked with Ricky Dillard & The New Generation Chorale and recently received a Stellar Gospel Music Award with the large choir based in Chicago. As a member of Our Own Thing Chorale, a group based in Ann Arbor, Mich., that sings spirituals, Lindsey toured South Africa in 2005. Doors for the concert will open at 6 p.m. Admission is $5 for adults and $3 for students. For more information, contact Lindsey at 567.868.8380 or the UT Department of Music at 419.530.2448. UT women’s soccer player Natalia Gaitàn is gearing up for another action-packed summer squaring off against the best competition in the world. The Bogota, Colombia, native will represent her home country in the Summer Olympics from July 25 through Aug. 11 in London. It will be the first-ever Olympic appearance for the Colombia women’s soccer team. Gaitàn, who will be a senior in the fall, is in the process of wrapping up her spring semester at UT and will fly home Friday, May 4. The following day, she will begin training with her national teammates in preparation for London and the XXXth Olympiad. The squad is expected to train together for the ensuing three weeks, take a weeklong break, then reconvene for three more weeks of practice before leaving for London. The three-year soccer letterwinner is one of four current NCAA Division I student-athletes on the Colombia national team roster, which includes Austin Peay’s Tatiana Ariza, Indiana’s Orianica Velasquez and Kansas’ Liana Salazar. Colombia, which will field one of 12 women’s soccer teams in the Summer Olympics, will find out its draw Tuesday, April 24. They qualified for the showcase event by reaching the finals of the 2010 South American Women’s Soccer Championships in Gaitàn’s hometown. Due to an intense schedule, the soccer competition actually kicks off two days before the opening ceremony of the Olympic Games with the first group matches. The competition will begin with a group stage. The teams will be divided into groups of four, and the best eight teams will qualify for the quarterfinals. From there, the competitions are a knockout format: The two winning semifinalists will play for the gold medal at Wembley Stadium, with the two losing semifinalists facing off for the bronze. The soccer competition at London will be staged at City of Coventry Stadium (Coventry), Hampden Park (Glasgow), Millennium Stadium (Cardiff), Old Trafford (Manchester), St James’ Park (Newcastle) and Wembley Stadium (London). Gaitàn possesses a wealth of national team experience. Last summer she served as a captain for Colombia at the 2011 FIFA Women’s World Cup in Germany. She is coming off an outstanding 2011 fall campaign for the Midnight Blue and Gold. Gaitàn was named second-team National Soccer Coaches Association of America (NSCAA) All-Great Lakes Region, first-team All-Mid-American Conference and third-team NSCAA Scholar All-America. 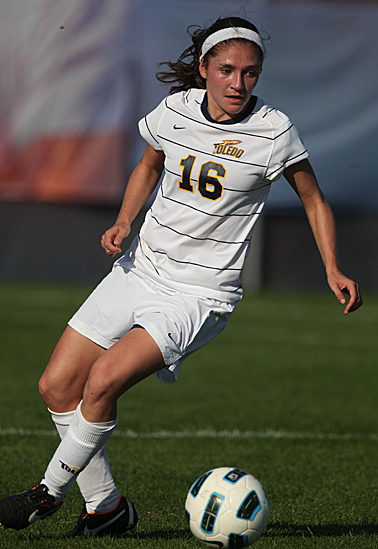 Gaitàn was an integral part of a Toledo defense that posted nine shutouts. She played every minute of 20 matches and finished fourth on the team with eight points (one goal, six assists), tied for fourth in the MAC in helpers. The Rockets finished with a 14-7-2 overall mark, 9-1-1 in the conference. UT successfully defended its MAC regular-season championship and captured a league-record fourth tournament title, advancing to the NCAA Tournament for the first time since 2008. UT Head Soccer Coach Brad Evans said Natalia’s passion for the game, her consistency, and her soccer instincts are impressive to observe on a daily basis. Gaitàn also excels off the field, holding a 3.95 GPA while double majoring in marketing and international business. For more information about the 2012 Olympics in London, visit www.london2012.com.